With no intention of joining the EU at all, the Swiss private banks are defending the bilateral path taken twenty years ago. In order to be able to continue along this path, the framework agreement deserves to be accepted after years of negotiations, even if some questions remain unanswered. Otherwise, relations with the EU will continue to deteriorate. The EU is and remains our most important trading partner. The members of the Association of Swiss Private Banks (ASPB) employ close to 5’400 persons in Switzerland and manage more than 800 billion in assets, which is more than 11% of the funds deposited in the country. An important part of their clients is domiciliated abroad, mainly in the EU, where 40% of the foreign private wealth deposited in Switzerland come from. It is essential that clients can be served in their country of residence. Having to wait for them passively in Switzerland represents a competitive disadvantage which is likely to worsen over time, as a result of an increasingly protectionist legislative framework. This is why the ASPB insists on the strategic importance of improving market access. For one year, the Association of Swiss Private Banks (ASPB) has supported the full deduction of foreign sanctions. In the meantime, the Council of States refused this solution, while noting that a middle way should be found between full deduction and absence of deduction. The proposition of the Economic affairs and Taxation Committees of the national Council goes in that direction. The ASPB supports this solution, but wishes a clarification concerning the damages. Regulation is a necessary evil to avoid a « wild » practice of certain professions. Many areas, however, suffer from an excess of rules, which obliges them to spend more and more time documenting the execution of their activity - at the expense of the latter. This administrative burden is especially heavy for banks, whereas the Swiss law imposes to respect the principle of proportionality, which means to be limited to what is necessary. A withdrawal of the Matter Initiative seems likely if the Federal Council definitely abandons its criminal tax law reform. As for the withholding tax, a parliamentarian initiative plans to replace it by a tax levied by banks on interest income. The Association of Swiss Private Banks supports these developments, because the withholding tax hinders international competitiveness and can be improved by focusing on its safeguard function. At the end of 2016, the Federal Council sent to the Swiss Parliament a draft federal law about the tax treatment of financial penalties. This draft is now in the hands of the Economic Affairs and Taxation Committee of the Council of States. The Association of Swiss Private Banks (ASPB) wants to shed light on the non-deductibility of penal sanctions. According to the ASPB, this measure can only have meaning in a purely Swiss context, since foreign penalties go against the Swiss legal system. AEoI: a last verification before its implementation! Since January 1st, 2017, Swiss banks have started collecting tax data for 38 countries. The government proposes to add 41 new countries next year. Which corresponds to Swiss commitments. But an authorisation from Parliament should not exempt the government from verifying again the existence of a "level playing field" and the confidentiality of information before sending client data in September 2019. 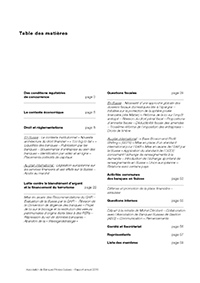 The paragraph 6 of the counterproposal allows a bank, with the client’s permission, to disclose his information to the tax authorities. Many banks will then only accept clients who provide this authorisation. While the paragraph 6 is meant to avoid the automatic exchange of information in Switzerland, it will enable it. To be consistent, this paragraph must be removed. The access to foreign financial markets is vital to a country with a solid financial centre. FinSA and FinIA bring Switzerland closer to that market access. The latest proposals of the independent asset managers point in the right direction. Rarely has an issue of such significance been put to the vote, while merely asking for the current situation to be maintained. The initiative "Yes to the protection of privacy", as well as its direct counter-proposal, aim to inscribe in the constitution the current law on tax offences. It is up to the Swiss people to determine the future of banking secrecy for Swiss residents. However, a refusal of the status quo would send a strong signal in favour of further weakening. In any case, Switzerland needs a consistent taxation system. The banking sector represents approximately 6% of the Swiss GPD and more than 8% of the overall tax income of the country. In order to maintain these revenues, the banks should be given the opportunity to grow domestically. The new draft proposed by the Federal Council to once more revise the Anti-Money Laundering Act (AMLA) is useless for Switzerland and harmful for its financial centre. Fortunately, the competent commission of the National Council saw through that. Automatic exchange of information: why such haste? The agreement with Australia should not be executed at once. Parliament should ponder the reasonableness of granting an automatic exchange of information to Australia, or any other country outside the EU, before other important financial centres have pledged the same. The Federal Council has been mandated to draft a report about FINMA by March 2015. 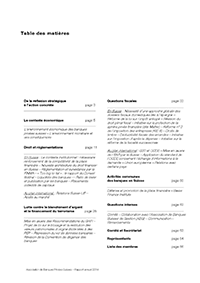 This report, entitled “FINMA and its regulatory and supervisory activities”, was published on December 18, 2014. The private banks worry about the Federal Council’s refusal to open discussions on the parliamentary initiative Lüscher. The time has come to implement the standard prepared by the OECD. On May 6, 2014, Switzerland announced its willingness to adopt this new standard, along with 65 other countries. It is now up to Parliament to ensure that Switzerland coordinates its position with the other important financial centres instead of positioning itself as the most diligent country to automatically exchange information. The Association of Swiss Private Banks (ASPB) published its 2017 Annual Report today. In the report, the ASPB reviews and analyses developments between April 2017 and March 2018 which affect the various issues it monitors. Positive changes over the past year include the loosening of certain regulations by FINMA, the adoption of a mechanism to safeguard data privacy in the context of the automatic exchange of information, and the active promotion of the Swiss Financial Centre. Nevertheless, a number of challenges remain, from improving market access to implementing pragmatic international standards and a stable and competitive fiscal framework. 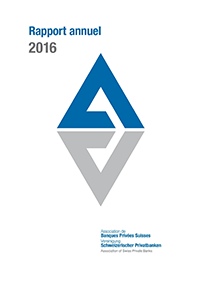 The Annual Report 2016 published by the Association of Swiss Private Banks (ASPB) reviews and analyses recent developments in the various issues it monitors and for which it advocates. Switzerland's efforts to adapt its financial regulations are starting to bear fruit, allowing the country to draw a line under its image as a tax haven. For Swiss private banks, the priorities are market access, the promotion of the Swiss financial centre and a sensible implementation of international standards. 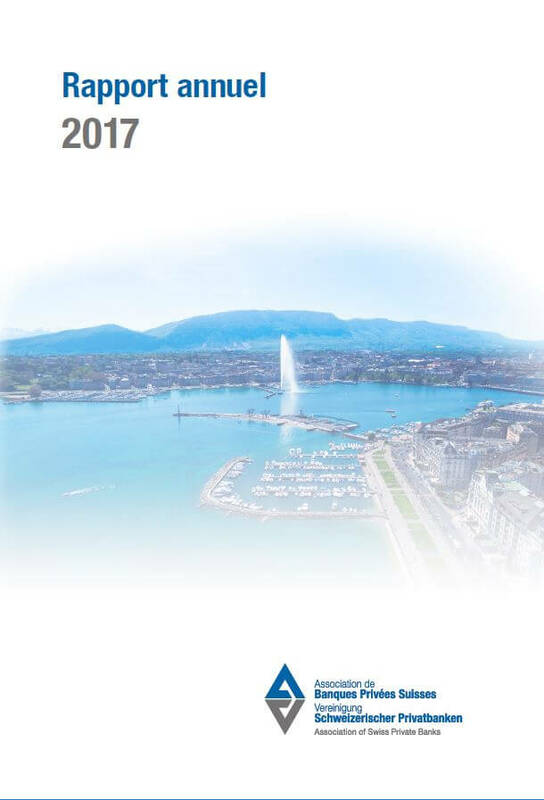 The Annual Report 2015 published by the Association of Swiss Private Banks (ASPB) discusses events that influenced the key issues addressed by the ASPB throughout the year to the end of April 2016. This includes market access, the implementation of automatic exchange of tax information and adjustments to the anti-money laundering laws. In a highly interconnected world, Switzerland needs to ensure a level playing field for all financial services providers while refraining from any "Swiss finish".